When it comes to teaching handwriting, choosing a handwriting curriculum and style is the most critical decision you are going to be making. Once you have made a choice, you need to see it through for at least the duration of the academic year. You can always change if it has gone horribly wrong, but of course no educational institution wants to do that – they want to choose once, choose wisely and choose properly. And so, time, care and consideration needs to be taken when considering the best handwriting curriculum, which is a critical decision for our children. There is a multitude of handwriting curricula, systems and styles out there which makes it hard to know how to choose. Each has its own claims, and it can be confusing to decide which one is the right one for your school. 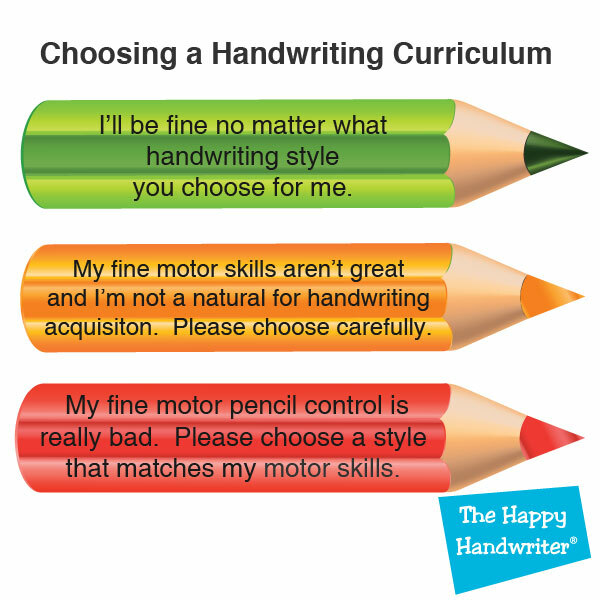 Let’s explore the principles we should be looking at when choosing a handwriting curriculum. 1. Handwriting Curriculum: Leave emotion out of it! The most critical first step is to lay emotion aside. We are living in the evidence based age, and yet there is something about handwriting and the choice of handwriting curriculum that invariably seems to be driven by emotion. We choose by what we think should work. I am not knocking practice based evidence – a teacher with years of experience knows what has worked in her classroom. But somehow, we hold onto things that we think will be good when, in fact, the evidence points to the contrary. So, we need to find and examine the evidence and make an informed decision, rather than falling into the trap of holding onto what is familiar and what we know. If you want to make the best decision, try and lay aside your inherent leanings towards one or another style or system and take an objective look at all the options in the light of the principles below. 2. Teaching Handwriting: Choose with the Lower Two Thirds in Mind. I have a “Bunty’s Rule of Thirds” which I like to apply to choosing a handwriting curriculum. We start by dividing the children into the top, middle and lower thirds, in terms of their potential for handwriting acquisition. We shouldn’t be selecting the handwriting curriculum based on the top third. The reality is when it comes to handwriting, the top third will do well whatever handwriting style we choose. We need to consider the middle and lower third of the class when choosing a style and curriculum. If you fail to consider the motor demands of the curriculum you choose, your middle third is going to fall to the bottom. And, in the same way, the bottom third is going to flounder. Choose well, with developmental motor abilities of the children in mind, and you have the potential to pull that bottom third up and stop the middle third falling to the bottom. So please do consider your lower two thirds and their abilities when making a handwriting curriculum choice. 3. Consider the Motor Demands of the Handwriting Style. We need to ensure the motor demands of the handwriting style are considered. There are many fonts with exit strokes that are believed to “make it easier to transition from print to cursive.” There are two issues to consider here. The first is that research has shown that, while the perception is that the transition to a joined-up script is easier if the exit stroke is already in place, this is in fact not so. The research has shown that children experience equal levels of difficulty whether the exit stroke is in place or not. So, I encourage you not to make this a defining element of choice for style or curriculum. If you wish to choose a handwriting style with an exit stroke that is fine, but don’t let it be on account of the basis that “it will make transition to a joined-up script easier,” since research has shown that this is simply not true. The second aspect of the exit stroke is at what developmental level it is introduced. Remember, we are looking at the middle and bottom third of the children when making our curriculum choice. So, we are not dealing with the children whose fine motor pencil control is the best. Place that in the context of our techno age where fine motor skills have plummeted, and we need to assume we do not have a strong base of pencil control in place. The exit stroke requires a high level of graded pencil control. Where this is not in place, the children tend to “flick” their pencils and lack control in forming this exit stroke. If we consider that the motor engram or motor map for handwriting is established in the brain through repetition, numerous repetitions of a poorly formed stroke will result in a motor map that is formed with a poor formation pattern. And once formed, these habits are very difficult to change. A child with poor pencil control who persistently “flicks” in place of a well-controlled exit stroke, will establish a “hard wired” motor map that has a poorly controlled flick which is messy and will present challenges when the time comes to transition to a joined-up script. And it is very challenging to change a motor map once is has become hard-wired. There is a popular handwriting style or font with an exit stroke that is said to have been chosen following research. And it was researched. The only thing was that the research was not based on the motoric demands of the script, but how appealing the children found it to read. There is no evidence whatsoever that the motor demands of the letter forms were considered. It was simply chosen based on what the children thought “looked nice.” Experience of occupational therapists who work with numerous children with handwriting difficulties, is that children with below average fine motor pencil control, battle to achieve the control required for the execution of the exit stroke. Similarly, a calligraphic style of handwriting that requires a 15° deviation from the vertical in the down stroke, is way beyond the developmental grasp of the Grade 1 child in the middle to lower third of the class in terms of handwriting acquisition abilities. They simply do not have the motor control to consistently achieve this. First think motor abilities, and then think handwriting style. It has to happen that way or, unless you are just lucky and hit the jackpot, it is going to come unstuck. We know that when handwriting is illegible, it affects marks awarded for written work and we need to protect our children against that. 4. Look for a Sensory-Motor Handwriting Approach. 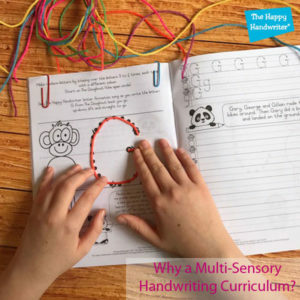 Research has shown that a sensory-motor approach strengthens the establishment of the “motor maps” or motor engrams for handwriting in the brain. It is critical to examine whether your handwriting system promotes this. Does the system incorporate tactile, kinaesthetic, and auditory input? Research has concluded that the difficulties experienced in mastering an automatic handwriting script are frequently due to a mismatch between the traditional copying teaching method, and the developmental abilities of the children. A research study showed no improvement in a handwriting intervention programme that used copying alone, while there was a 1.4 standard deviation improvement in those who introduced the letter forms visually and verbally. If you know a little about stats, you will know that is one amazing improvement! Our children need the multi-sensory approach, and this is not limited to the children in preschool and Grade 1. It continues for our Grade 3 children. It is not “baby stuff.” It is the stuff that well-developed, legible and automatic handwriting is made of. I’m not suggesting you make your Grade 3 children form their letters in starch paint! There are ways to ensure they get the sensory-motor input without causing a chaotic mess in the classroom – I wouldn’t want that either! Please do consult an occupational therapist (OT) with a unique understanding of the fine motor development of our children. They know what the children are able to cope with in terms of the fine motor pencil control demands of your proposed handwriting style. They are your consultants, your advisors. If teachers had this in-depth knowledge they would be OT’s. And we don’t want them to be OT’s – they are way too precious a resource! They have a wide understanding, amongst many other aspects, of the complexities of childhood development including maths, literacy and social-emotional development. This does not leave time for in-depth knowledge of the anatomy of the hand and the finer points of the development of fine motor pencil control. Your OT is there for that – consult them for an opinion. If your children are struggling to achieve a good, legible and automatic script, you need to be reconsidering your handwriting curriculum, and or, the teaching methods. Teachers are frequently thrown in the deep end when it comes to teaching handwriting and so frequently adopt the copy and reproduce approach that they themselves were taught with. Handwriting is critical to our children’s development. We can’t say teaching it takes too long. Take a read of my free downloadable eBook – Handwriting in the Techno Age: 5 Reasons it Should Stay. And once you have truly considered those points, you will know that handwriting is a priority. It is critical to our children’s ability to progress through school and we need to give it the place it deserves. The Department of Basic Education CAPS statement lays out the handwriting curriculum, alongside the other subjects. The curriculum is jam-packed and time in the classroom is at a premium. 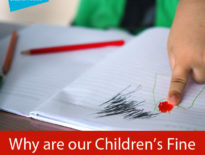 When considering the 5 Reasons Handwriting Should Stay – and there are more than just those 5 – we realise we need to be giving it more time and not less, as it is the foundation that underpins future academic success in our children.